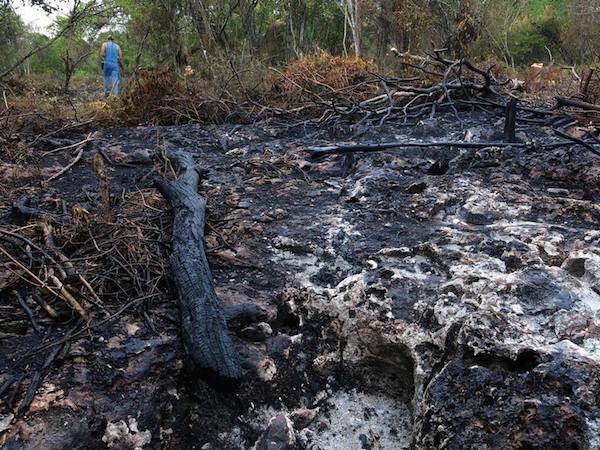 Forest inside a Dominican Republic national park burned to clear land for crops. Photo by Miguel Landestoy. One makes whimsical clicking and whistling noises, while the other communicates in quiet, bird-like chirps. The first is one of the planet’s only venomous mammals, the Hispaniolan solenodon (Solenodon paradoxus), while the second is Cuvier’s hutia (Plagiodontia aedium), a cryptic rodent that is nocturnal and arboreal. Close relatives of both species have suffered extinctions and severe habitat loss in the past. 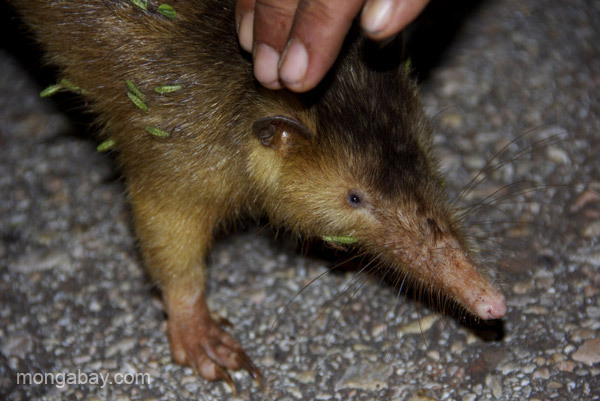 Currently, the IUCN lists the hutia and solenodon as Endangered, and they face fresh threats in their Caribbean range. This is true even in official protected areas, such as the Dominican Republic’s Biosphere Reserve of Jaragua-Bahoruco-Enriquillo, where conservationists have been uncovering widespread illicit deforestation during the past three years. 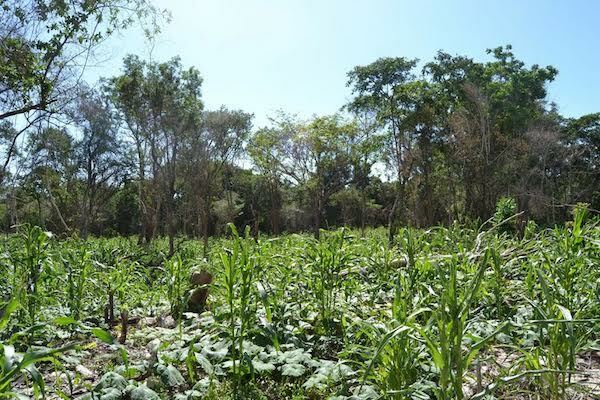 In late 2014, an irregularity in the issuance of permits for agriculture-related deforestation was brought to light by Diario Libre, the leading newspaper in the Dominican Republic. On July 30, the Pedernales office of the Ministry of the Environment and Natural Resources granted permission to local landowners to deforest an area within Jaragua National Park, close to an area that had been identified as critical habitat for the hutia and solenodon. .
A solenodon caught in the Dominican Republic for a monitoring project. Photo by Tiffany Roufs. According to León, Leovigildo Méndez, Director of Environment for the Province of Pedernales, along with his technician, Rodolfo Méndez, granted permission to Manuel Herasme and his partner, Felisindo, to deforest a piece of land that León argues is within the confines of the Jaragua National Park. In November 2014, León, representing Grupo Jaragua, along with members of the press from Diario Libre, a Dominican newspaper, visited the office that granted the permit. León and her team took coordinates at the site of the deforestation, but when they asked the permit office for their own coordinates, to compare the two, Rudolfo Méndez was unable to produce them. León identified a map hanging on the office wall that clearly outlined the protected area, but she believes that the officials either didn’t know how to reference the coordinates to the map, or didn’t care to do so. Satellite imagery of the cleared region. The top images were taken in 2011 and show the areas that were permitted to be deforested (outlined in red) – clearly within the bounds of the National Park. The bottom row shows Landsat images; the left captured on May 8, 2014, prior to clearing, and the right on September 30, 2014. Maps by Yolanda León, Grupo Jaragua. Click to enlarge. Forest was cut and burned to clear the land. Photo taken in early October 2014 by Miguel Landestoy. By December 2014, crops were growing at the deforested sites. Photo by Yolanda León. 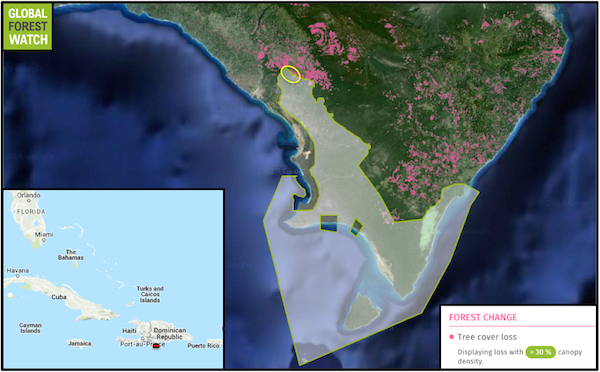 The area that León describes as cleared in the video above comprises approximately 15 hectares of land (0.15 square kilometers) within the national park – not a very large area as deforestation goes. However, the permit that was granted erroneously specified only 12 hectares to be deforested, although the process of clearing the land was not complete at the time of her visit. León believes this is not an isolated problem. “But in this general area, under this sharecropping system, the deforestation under Jaragua and Sierra de Bahoruco National Parks boundaries is at least 20 square kilometers,” León said. In addition, she has recorded another 35 square kilometers of cloud forest cleared within the Sierra de Bahoruco National Park on the southern slopes of the mountain range. In a December 2014 press release, the Ministry of the Environment officially announced the removal of Leovigildo Méndez from his post, naming Ramón Marrero in his place. “We will not permit any actions that can hurt our environment and natural resources,” states Minister of the Environment, Bautista Rojas Gómez, in the release. However, León alleges Méndez was not completely dismissed, and instead was moved to another position within the Ministry. “Unfortunately, we just heard [ Leovigildo Méndez] was not fired, but has now been appointed as Coastal Marine Supervisor for three southern provinces (which includes Pedernales),” León told mongabay.com. Attempts by mongabay.com to contact officials at the Dominican Republic Ministry of the Environment and Natural Resources by phone and e-mail were unsuccessful. The Ministry’s press release indicates that Manuel Herasme, the person to whom the permit was granted has been ordered to reforest the burned land and pay damages. Several news reports showed a number of animals – including snakes and lizards – that were killed when the deforestation took place. Trees weren’t the only things burned when the forest was cleared. 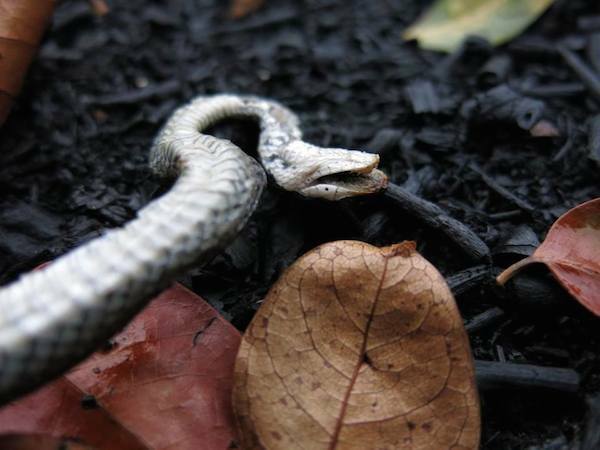 This snake couldn’t escape in time and became collateral damage. Photo by Robert Ortiz. 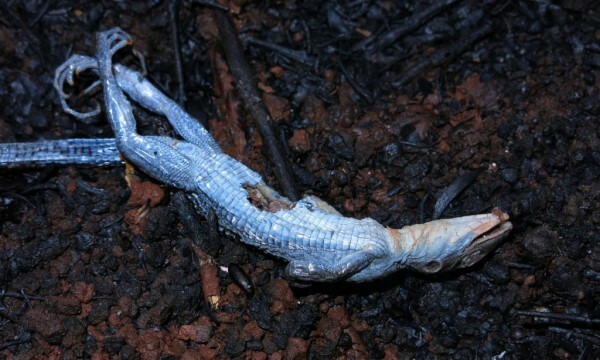 A lizard that perished in the fire. Photo by Miguel Landestoy. Scientists are still mapping the full range of the hutia and the solenodon on the island of Hispaniola in the Caribbean, which is shared by both Haiti and the Dominican Republic. Little is known of the stability of their populations, how resilient they are to habitat alterations and invasive predators, their genetic diversity across the island, and most importantly, what has allowed these two species to survive when so many other West Indian species have succumbed to extinction. A collaboration of institutions from the United Kingdom and the Dominican Republic came together in early 2009 to embark upon a three-year study of the hutia and the solenodon under the auspices of a Darwin Initiative Grant. The project was titled “Los Ultimos Sobrevivientes – salvando el Solenodonte y la Hutia de la Hispaniola,” or “The Last Survivors – saving the Hispaniolan solenodon and hutia.” The Durrell Wildlife Conservation Trust, set up originally by Gerald Durrell, led the Last Survivors Project in conjunction with the Sociedad Ornitológica de la Hispaniola, the Zoological Society of London, the Parque Zoologico Nacional, and the Secretaria de Estado de Medio Ambiente y Recursos Naturales de Republica Dominica. They began an island-wide monitoring and awareness-raising program, unearthing along the way evidence of habitat threats in the region. 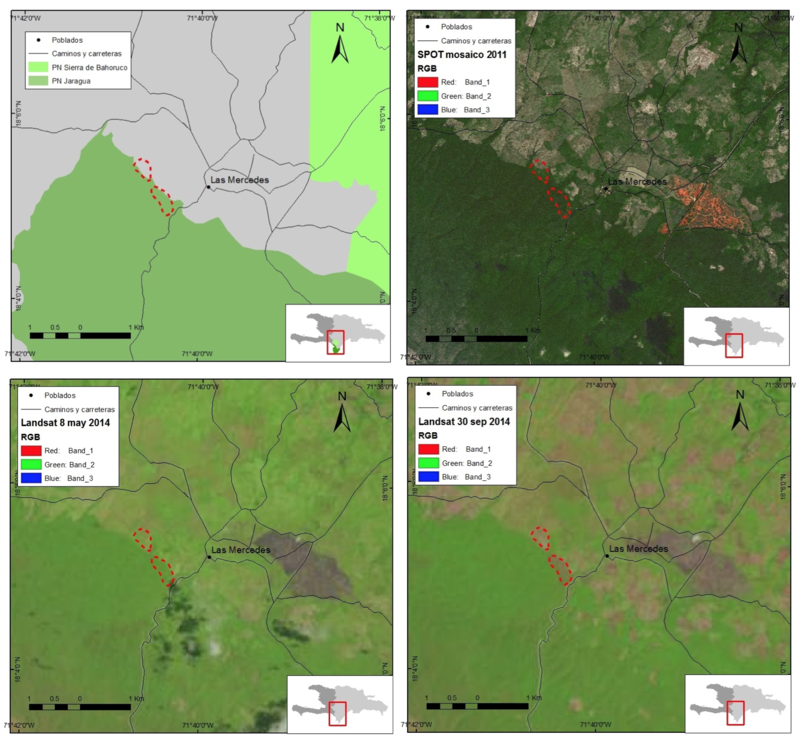 Data from Global Forest Watch shows forest has been relatively protected within Jaragua National Park (highlighted on the map) losing just over 350 hectares of its 158,000-hectare area from 2001 through 2013. 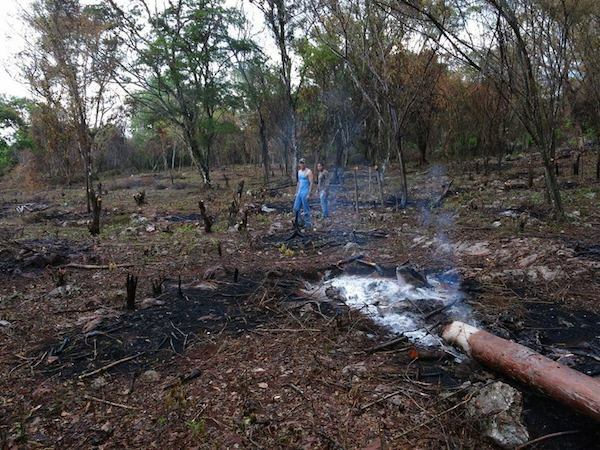 However the surrounding region – including Sierra de Bahoruco National Park to the north – lost significantly more of its forests, with Pedernales Province losing about 10,000 hectares – or 5 percent – of its tree cover during the same period. The yellow circle indicates the area where environment officials erroneously granted clearing permits. Click to enlarge. Rosalind Kennerley is a scientist who worked on the ground with the Durrell Conservation group on the Last Survivors Project, conducting research for her graduate thesis dissertation on the use of tracking methods to better understand the basic ecology and habitat associations of the solenodon and hutia. Her work, largely conducted in the vicinity of the villages of Las Mercedes and Mencia, involved tracking solenodon that used both unprotected areas and the Jaragua National Park. 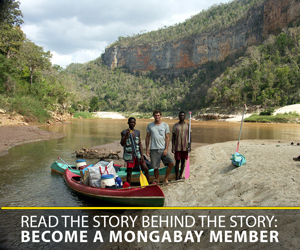 Kennerley described the area to mongabay.com as a biodiversity hotspot, one of the last refuges for the hutia and the solenodon. The West Indies was, at one time, home to a large and diverse group of mammalian fauna – including sloths, primates, rodents and insectivores. Today, only 15 species are known to survive, all within just two mammalian families, both of which are exclusively found in the Caribbean. According to Last Survivors, two species of solenodon are the only extant Caribbean insectivores, and they are found on Hispaniola and Cuba. The hutia is the only rodent native to Hispaniola. Grupo Jaragua and Last Survivors fear for the future of these animals, and encourage a deeper look at the processes governing permit granting and land use in the area. León described the current state of national park boundary demarcation in the Siera de Bahoruco and beyond to be virtually nonexistent on the ground. Diario Libre’s investigation of the matter, led by reporter Marvin del Cid, describes a signpost for the National Park, set 1.5 kilometers within its boundaries, so old and rusted that only the word “Welcome” was clearly visible. It stands isolated in a cleared patch of land. See here for a translated version of the article, by the Vermont Center for EcoStudies. UNEP-WCMC, UNEP, and IUCN. “World Database on Protected Areas.” Accessed on 23 April 2015. www.protectedplanet.net.